Bowling is a rather interesting sport to us, which should come as no surprise due to the fact that we’re Albuquerque’s go-to bowling center for the best bowling deals in town. One of the things that’s so interesting about this sport is that many people either take it very seriously or only play recreationally about once every blue moon. It’s almost difficult to find bowlers who fall into the middle ground where they enjoy playing the game, but they’re not playing in a competitive league. At Lucky66 Bowl, we’ve come to find out over time that many casual bowlers actually enjoy playing in casual, just-for-fun bowling leagues designed for a good time every week. So, due to this massive variance of relative skill level in all of the bowlers we see, we’ve also witnessed our fair share of bowling myths throughout the years. 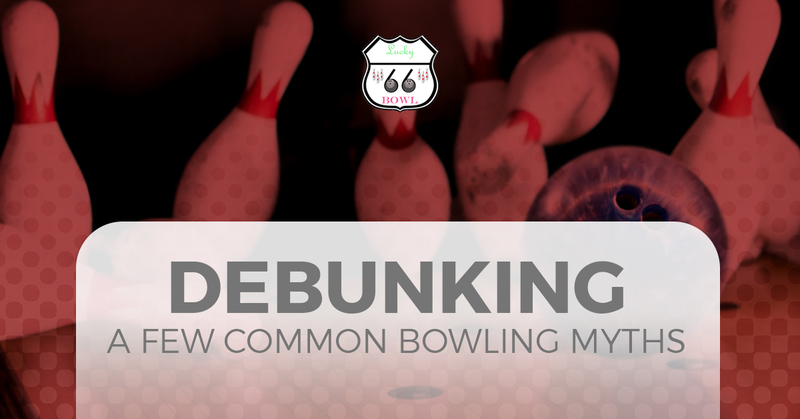 In the interest of setting realistic expectations before you come join in on the fun at one of our exciting Albuquerque bowling leagues, we recommend that you familiarize yourself with these bowling myths. If you’re curious about our ten pin bowling games, bowling deals or anything else about our bowling lanes, don’t search “bowling alley near me” on your smartphone – learn more by visiting here. Well, right off the bat, throwing the ball down the very center of the lane is better than going straight into the gutter. We’ll give our readers that one. However, throwing strikes and spares is all about hitting the pockets in between the pins at the right angle and speed. What looks like a perfect throw might actually only knock down 4 or 5 pins to the frustration of the bowler. Ideally, aim your first shot of the frame just to the left or the right of the center pin, if you can. Many people tend to believe that a heavier bowling ball automatically equates to more speed and power, but it’s not necessarily true. While a heavier bowling ball might mean a greater impact on the pins, what good is a fifteen or sixteen-pound ball if you can’t lift it, throw it and aim it properly? Most bowlers, whether professional league-goers or casual ones, will have better success with a ball that feels comfortable to them and one that they can actually throw with a sense of accuracy. Now, we’re not going to discourage you from visiting our pro shop here at Lucky66 Bowl, but if you have little to no bowling experience and you waltz in expecting a brand new bowling ball and shoes to make you start throwing strikes, you probably have the wrong idea. If you’re a seasoned bowler with a good idea of what to look for then getting new equipment may help out your game, but otherwise, it won’t really make a noticeable difference. Come Bowl With The Best In The West! Accommodating serious and non-competitive bowlers, our Albuquerque bowling games here at Lucky66 Bowl offer something for everyone. Get in touch with us if you have any questions about our bowling services, and come check out our bowling lanes and banquet halls today!